The cars at right were northbound on historic US 25 (now NC hwy. 225); US 176 begins by heading off into the distance at left along New Spartanburg Road. 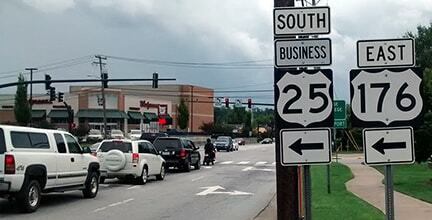 Business 25 is also ahead, as well as to the left. 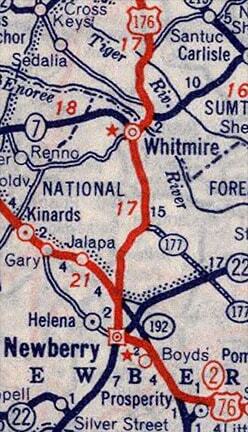 By 2017 the spanwire had been replaced, and a US 176 marker was posted on a signal mast arm instead. Later US 76 was changed to follow its current bypass (Wilson Road), and then south via College (as shown on the map above). But even then, it is likely that US 176 did not end at that junction; instead it was probably overlapped with US 76, ending at this same corner. 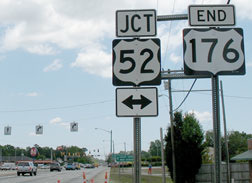 ​The east beginning of US 176 is to the right.